The price of Brent crude oil averaged $54/barrel (b) in 2017, an increase of $10/b from 2016. EIA’s January Short-Term Energy Outlook forecasts Brent to average $60/b in 2018 and $61/b in 2019. In both 2018 and 2019, EIA expects total global production to be slightly greater than global consumption, with U.S. production increasing faster than production in any other country, contributing to modest inventory builds. 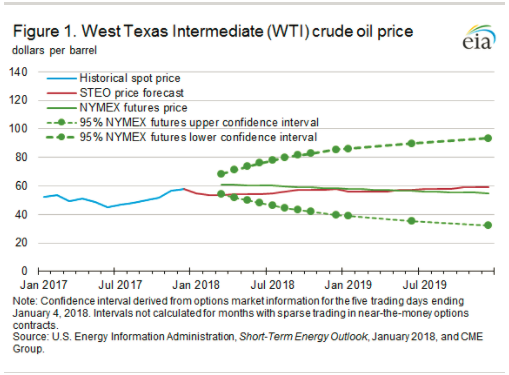 EIA forecasts the West Texas Intermediate (WTI) crude oil spot price will average $55/b in 2018 and $57/b in 2019 (Figure 1). Average WTI crude oil prices are forecast to stay between $4/b and $5/b lower than Brent prices in both 2018 and 2019, falling from the $6/b average price difference seen in the fourth quarter of 2017. The narrowing price discount of WTI to Brent in the forecast is based on the assumption that current constraints on the capacity to transport crude oil from the Cushing, Oklahoma, storage hub to the U.S. Gulf Coast will gradually lessen. Because U.S. production increases will need to compete for market share in Asia, the difference between Brent and WTI prices is supported by cost differences to get there. EIA estimates that, without pipeline constraints, moving crude oil from Cushing to the U.S. Gulf Coast typically costs $3.50/b and that it costs approximately $0.50/b more to transport WTI from the United States to Asia than to ship Brent from the North Sea to Asia. Although more infrastructure to export crude oil has been recently built, U.S. exporters must still use smaller, less-economic vessels or complex shipping arrangements, which add to costs. 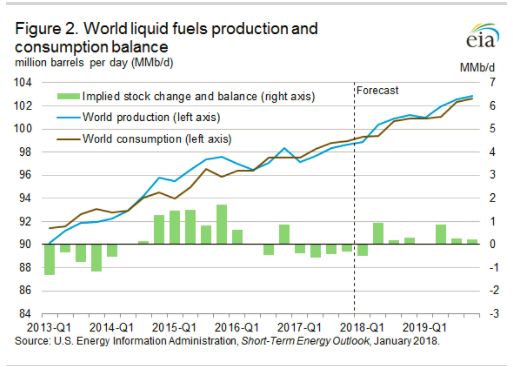 EIA estimates that the implied global stock change (the difference between total world consumption and total world production) averaged 0.4 million barrels per day (b/d) in 2017, marking the first year of global inventory draws since 2013 (Figure 2). EIA expects global inventories to increase by about 0.2 million b/d in 2018 and by about 0.3 million b/d in 2019. EIA forecasts that the expectation of inventory builds in 2018 and 2019 will contribute to Brent crude oil prices declining from current levels ($69.08/b on January 9) to an average of $60/b during the first quarter of 2018. Despite the prospect of flat crude oil prices into the future, EIA forecasts total U.S. crude oil production will increase to an average of 10.3 million b/d in 2018, up 1.0 million b/d from 2017. That level would be the highest annual average on record, surpassing the previous record of 9.6 million b/d set in 1970. In 2019, crude oil production is forecast to rise to an average of 10.8 million b/d. The Permian region alone is expected to produce 3.6 million b/d of crude oil by the end of 2019, which is about 33% of total U.S. crude oil production and about 0.8 million b/d more than estimated December 2017 levels. Global consumption of petroleum and other liquid fuels grew by 1.4 million b/d in 2017, reaching an average of 98.4 million b/d for the year. EIA expects consumption growth will average 1.7 million b/d in 2018 and 1.6 million b/d in 2019, driven by the countries outside of the Organization for Economic Cooperation and Development (OECD). Non-OECD consumption growth is expected to account for 1.2 million b/d and 1.3 million b/d of the growth in 2018 and 2019, respectively. The forecasted non-OECD petroleum and other liquid fuels consumption growth is driven by expectations of increased Gross Domestic Product (GDP) growth. Growth in non-OECD GDP is expected to be 4.3% in 2018 and 4.4% in 2019, up from 3.9% in 2017. In OECD countries, petroleum and other liquid fuels consumption increased by 0.4 million b/d in 2017, and EIA then expects it to grow by 0.5 million b/d in 2018 and by 0.3 million b/d 2019. The main driver of OECD consumption growth is the United States. Total U.S. petroleum and other liquid fuels consumption is forecast to average 20.3 million b/d in 2018, an increase of 470,000 b/d (2.4%) from the 2017 level, and is forecast to grow by 340,000 b/d (1.7%) in 2019. The growth in both years is led primarily by higher consumption of hydrocarbon gas liquids with more modest increases in distillate, motor gasoline, and jet fuel. The U.S. average regular gasoline retail price rose slightly from the previous week, remaining at $2.52 per gallon on January 8, 2018, up 13 cents from the same time last year. The West Coast price rose nearly four cents to $3.01 per gallon, the East Coast price rose one cent to $2.50 per gallon, and the Gulf Coast and Rocky Mountain prices each rose less than one cent, remaining at $2.24 per gallon and $2.44 per gallon, respectively. The Midwest price fell nearly three cents to $2.43 per gallon. The U.S. average diesel fuel price rose more than 2 cents to $3.00 per gallon on January 8, 2018, 40 cents higher than a year ago. The East Coast price increased nearly five cents to $3.03 per gallon, the West Coast price increased three cents to $3.39 per gallon, and the Midwest and Gulf Coast prices each increased over one cent to $2.95 per gallon and $2.79 per gallon. The Rocky Mountain price fell less than one cent to $2.97 per gallon. U.S. propane stocks decreased by 6.3 million barrels last week to 61.7 million barrels as of January 5, 2018, 10.2 million barrels (14.2%) lower than the five-year average inventory level for this same time of year. Midwest, Gulf Coast, East Coast, and Rocky Mountain/West Coast inventories decreased by 2.8 million barrels, 2.6 million barrels, 0.7 million barrels, and 0.2 million barrels, respectively. Propylene non-fuel-use inventories represented 4.0% of total propane inventories. As of January 8, 2018, residential heating oil prices averaged almost $3.18 per gallon, 9 cents per gallon more than last week and 53 cents per gallon higher than last year’s price at this time. The average wholesale heating oil price for this week averaged nearly $2.20 per gallon, nearly 2 cents per gallon more than last week and almost 43 cents per gallon higher than a year ago. Residential propane prices averaged $2.55 per gallon, 3 cents per gallon more than last week and 25 cents per gallon higher than a year ago. Wholesale propane prices averaged nearly $1.15 per gallon, 3 cents per gallon more than last week and 29 cents per gallon higher than last year’s price.